The new Captain America, a member of Hydra? 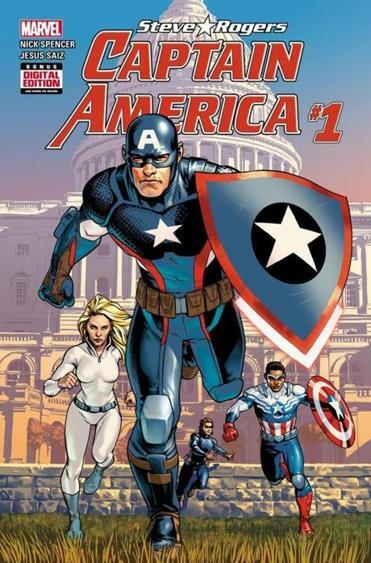 The "Captain America: Steve Rogers #1" comic book by Nick Spencer and Jesus Saiz. The new ‘‘Captain America: Steve Rogers #1’’ comic book hits stands Wednesday featuring the return of the original Captain America, Steve Rogers, but with a shocking twist: in the final pages Rogers throws a fellow hero out of a plane to his death and says ‘‘Hail Hydra,’’ the salute of the longtime Marvel Comics terrorist group Hydra. The patriotic hero’s apparent heel turn, following months of sitting on the sidelines, is the highlight of the new No. 1 issue written by Nick Spencer and drawn by Jesus Saiz, and the book’s editor, Tom Brevoort, wants people to know they aren’t falling back on any of the old comic-book switcheroos — a clone, a life model decoy or a Steve Rogers from another dimension — for this reveal. ‘‘That’s the real dude, and you’ll find out the whys and wherefores in the second issue,’’ Brevoort said. Captain America has always reflected the era he’s lived in, and adding this level of complexity to Steve Rogers’ character just reflects where we are as a country, Brevoort said. ‘‘In the zeitgeist of the moment that we’re in, in the middle of sort of a very volatile election cycle where there’s a lot of strange things going on in the world of politics, and the world and the country, it feels kind of appropriate, kind of right timing-wise, that you could get a revelation like this and it not feel out of step with where the nation happens to be in the moment,’’ he said. Captain America has been the focus of three movies from Marvel Studios: ‘‘Captain America: The First Avenger,’’ ‘’Captain America: The Winter Soldier’’ and the current ‘‘Captain America: Civil War.’’ As a comic book character, he’s gone through several changes in the last few years, including Rogers dying in the comic book’s ‘‘Civil War’’ event and being resurrected; and being replaced as by former sidekicks Bucky and the Falcon as the official Captain America. ‘‘Captain America: Sam Wilson’’ will run in conjunction with ‘‘Captain America: Steve Rogers,’’ with stories Brevoort called ‘‘two sides’’ of the same coin. Rogers’ new status also helps explain why Wilson, the first black Captain America, is keeping the identity and the shield. Any change in Captain America always brings controversy, and Internet leaks meant hate email from irate fans has already started, he said. ‘‘It speaks both to the strong connection that people have for Steve Rogers as an individual or even Captain America as an idea,’’ he said. Captain America is ‘‘not just another superhero. He wears the colors of the nation and he’s meant to represent and reflect what the national dialogue is at any given point,’’ Brevoort said.